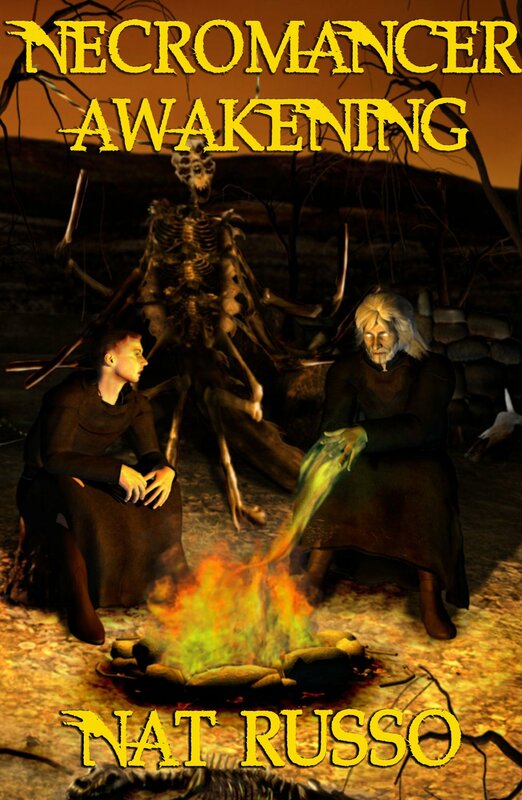 Necromancer Awakening by Nat Russo is one of the finest examples of fantasy genre fiction I have ever seen. I started to say, “seen in a long time,” but the qualifier isn’t applicable, since Russo is well able to hold his own among such lights as Martin, Gaiman and Gabaldon. Texas archaeology student Nicolas Murray has an ironic fear of the dead. A latent power connecting him to an ancient order of Necromancers floods his mind with impossible images of battle among hive-mind predators and philosopher fishmen. When a funeral service leaves him shaken and questioning his sanity, the insidious power strands him in a land where the sky kills and earthquakes level cities. A land where the undead serve the living, and Necromancers summon warriors from ancient graves to fight in a war that spans life and afterlife. Nicolas’s power could be his way home… Or it could save a world that wants him dead. Russo builds a world intrinsically different from our own, yet manages to draw strands of connection that allow the reader to inhabit that world in breathless anticipation of “what happens next.” Nicolas begins as a smart mouthed college student with a penchant for defiance, yet we like him, and sympathize with his struggles. We want him to succeed. All the characters in this novel are beautifully drawn and nuanced with a depth that lends credibility and heart to subject matter that might otherwise prove too creepy to read. Although, I have to say, the creep factor was part of what kept me turning pages. Though in many cases, the structure of this world, its rules and conventions, are counterintuitive to many common belief systems here on Earth, Russo’s grasp on that structure is so certain and consistent that the reader is happily pulled into the adventure. It is easy to fall in love with the beauty and paradox of this strange world, and to root for its people against an eminently hateable evil. This is fantasy at the apex of a very talented author’s skill and imagination. There are good reasons this book is in the top three on no less than four genre rankings. As there are too many to go into here, I strongly recommend finding them out for yourself as soon as possible. Nat Russo was born in New York, raised in Arizona, and has lived just about everywhere in-between. He’s gone from pizza maker, to radio DJ, to Catholic seminarian (in a Benedictine monastery, of all places), to police officer, to software engineer. His career has taken him from central Texas to central Germany, where he worked as a defense contractor for Northrop Grumman. He’s spent most of his adult life developing software, playing video games, running a Cub Scout den, gaining/losing/gaining/losing weight, and listening to every kind of music under the sun. Along the way he managed to earn a degree in Philosophy and a black belt in Tang Soo Do. He currently makes his home in central Texas with his wife, teenage son, and a mischievous beagle.